Technical Analysis Functions for Excel (Analyzer XL) is a library of 146 technical analysis functions, indicators and experts in the form of Excel formulas. An indicator is used to determine the trend of a market, the strength of the market and the direction of the market. An expert is a predefined stock market system. All 146 formulas include wizards that make entering data easy. The Technical Analysis Function's seamless integration with Excel provides opportunities for customization that are just not possible with competing software packages. With knowledge of VBA, traders can easily develop custom indicators and experts in a fraction of the time it would take with other software. Users can also create and name macros using the AnalyzerXL interface. An indicator is used to determine the trend of a market, the strength of the market and the direction of the market. Expert functions produce special outputs, such as Buy/Sell signals, trend directions and more. 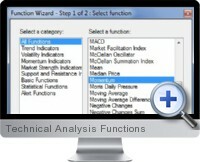 All technical analysis functions are categorized by the type of output they produce. There are two types of outputs: Formulas and Values. Formulas are automatically re-calculated when you change input data, whereas Values remain the same. With Formulas, you do not need to re-enter range references or function parameters when you update data. Downloader XL - downloads free historical stock, index and mutual fund data from Yahoo! Finance. Historical data is available from exchanges in the USA, Canada, UK, Ireland, Germany, France, Italy, Australia, New Zealand, India and more. BulkQuotes XL - designed to handle easily downloads and updates for tens or hundreds of tickers simultaneously. BulkQuotes XL is designed as an Excel add-in, giving you great flexibility and allowing you immediately to apply technical analysis to downloaded data. You can even have your own macros applied instantly to all your tickers. Options XL - an option chains and LEAPS series download tool for Microsoft Excel. It downloads chains for options traded on these exchanges: CBOE (Chicago Board Options Exchange), AMEX (American Stock Exchange), PHLX (Philadelphia Stock Exchange), PCX or PSE (Pacific Stock Exchange), ISE (International Securities Exchange).